Hello Cranberry Tea Time Friends! 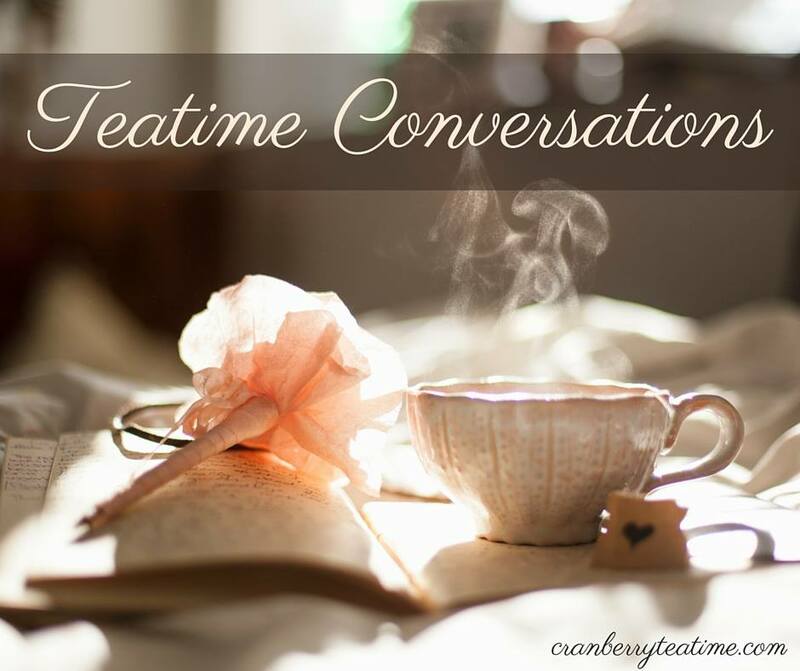 It has been so long since we last chatted here on my blog! Is anyone still around? :) We had a full and busy summer. Now that we're back in a fall routine, I'm ready to start blogging again! But first, here are some highlights from our summer. For our family vacation we went to the Henry Doorly Zoo in Omaha, Nebraska. We had a wonderful time! If you are ever near Omaha, this zoo is definitely worth checking out. Tired, but happy, at the zoo. My sister, Krista, came to visit at the end of June, and we had so much fun while she was her here. There were trips to the pool, the playground, s'mores made, rhubarb cobbler baked, and many cool lego projects built. Pictured above are William and Krista with a Hobbit-hole that they designed. My parents came at the end of July, and they were a huge help to us. They took care of the children and me while Will went to a conference. My dad helped with numerous projects around the house, which delighted Adelaide to no end. She exclaimed, "Opa can fix everything!" And he sure did fix a lot of things while he was here! 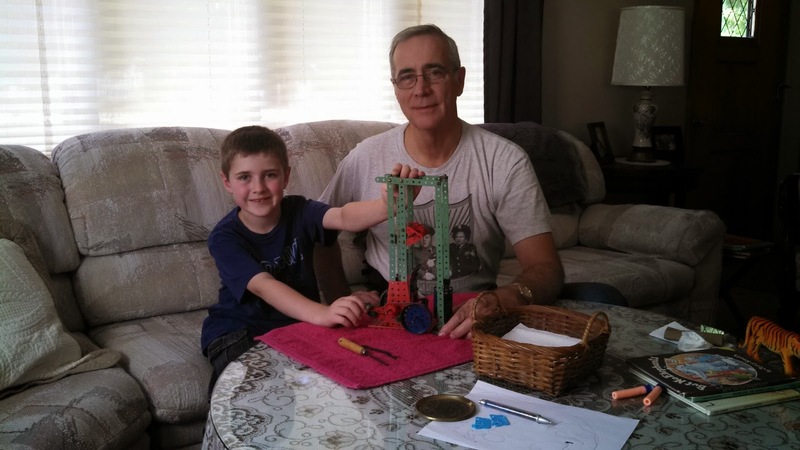 In the picture above William and his Opa have just finished building a pile driver with an Erector Set. It worked well, and they took it outside and used it to drive a nail into the ground. 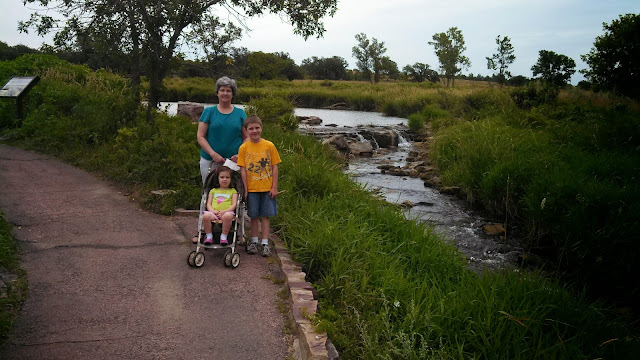 The children went on a hike with Opa and Nana. The stroller is a special treat for Adelaide. Usually she rides on my lap in a wheelchair, but when I'm not around and she gets to use her stroller, and she thinks it is so much fun! 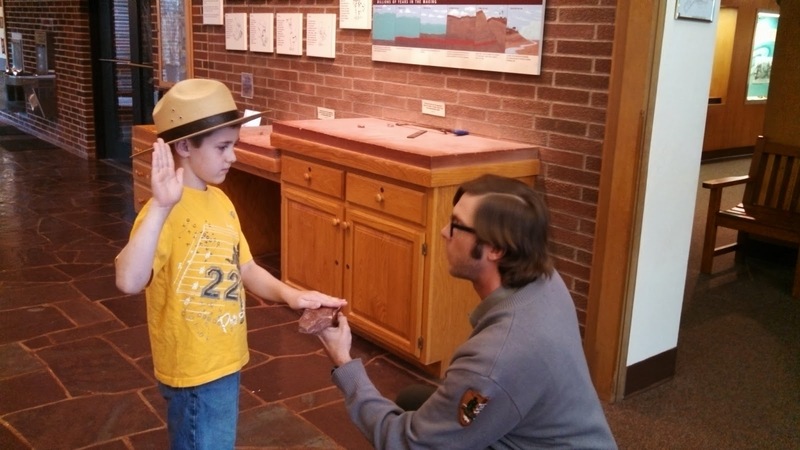 William became a Junior Ranger. We went to the county fair in August with my parents. Adelaide had been talking all year about riding the dragon roller coaster again. She absolutely loved it last year, but this year she found it a little bit scary! Adelaide loves goats, and has since she first discovered them at the Creation Museum petting zoo when she was a year old. Some people were watching Adelaide watch the goats instead of looking at the goats themselves! Feeding goats was a highlight of the county fair. Adelaide won first place on her peanut butter cookies in the junior division! She was so very excited. William and I won some ribbons as well, but I completely forgot to take pictures of our entries. How about you, friends? What is a highlight from your summer? Thanks for the updates, Rachel. Looks like y'all had lots of fun. Pretty face with beautiful eyes, full of very tender happiness!